WHATS IN IT FOR ME? Information technology lives all around us-in how we communicate, how we do business, how we shop, and how we learn. Smart phones, iPods, PDAs, and wireless devices dominate our lives, and yet it's all too easy for students to take information technology for granted. 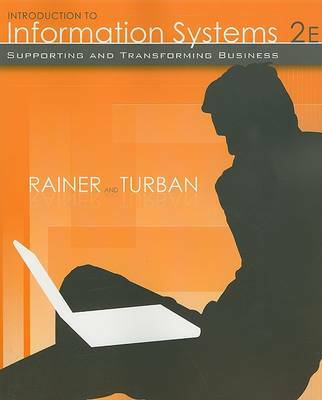 Rainer and Turban's Introduction to Information Systems, 2nd edition helps make Information Technology come alive in the classroom. This text takes students where IT lives-in today's businesses and in our daily lives while helping students understand how valuable information technology is to their future careers. The new edition provides concise and accessible coverage of core IT topics while connecting these topics to Accounting, Finance, Marketing, Management, Human resources, and Operations, so students can discover how critical IT is to each functional area and every business. Also available with this edition is WileyPLUS - a powerful online tool that provides instructors and students with an integrated suite of teaching and learning resources in one easy-to-use website. The WileyPLUS course for Introduction to Information Systems, 2nd edition includes animated tutorials in Microsoft Office 2007, with iPod content and podcasts of chapter summaries provided by author Kelly Rainer.